You might have noticed that when you back up to Matthew 1:21, you find an angel speaking to Joseph in a dream telling him to go ahead and marry Mary because the baby inside her was from the Holy Spirit. The angel also tells him what to name the baby. 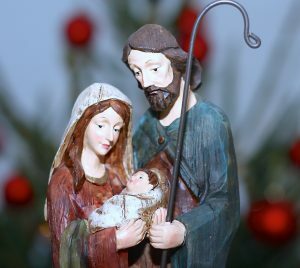 As you might expect, many people have thought that maybe Mary and Joseph didn’t quite get their new baby’s name right. 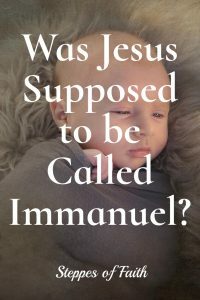 Wasn’t He supposed to be called Immanuel? 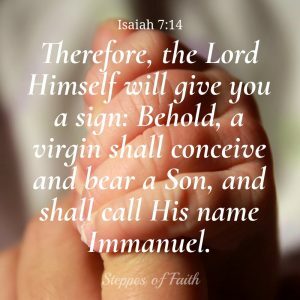 Why did God tell Isaiah the Messiah’s name would be Immanuel, but the angel told Joseph it would be Jesus? The answer lies in the difference between His name and His nature. You probably know lots of people. Some of them might be named Richard, Susan, Thomas, or Deborah. You might call them by those names or you might call them by Rich or Rick, Susie, Tom or Tommy, or Debbie or Deb. Maybe your kids call their friends “bestie” or “bro” or “dude.” They have what we call nicknames. How about your spouse or the one you’re dating? Do you sometimes call them “honey,” “sweetie,” or “babe?” Those are terms of endearment, another kind of nickname. It’s the same with Jesus. A few chapters after Isaiah was talking with Ahaz (9:6), Isaiah went on to describe the Lord as “Wonderful, Counselor, Mighty God, Everlasting Father, Prince of Peace.” Was Isaiah telling us that the Son of God’s actual given name is “Wonderful” or “Everlasting Father?” No. Isaiah is telling us certain terms of endearment for the Lord. These names describe His nature, His attributes. They describe His power and glory. American theologian of the 1800s, Albert Barnes, once commented on what Isaiah was trying to say. What Barnes is saying is that it was common language in Isaiah’s time to use the same verb to mean both “to be called” and “to be.” So, Immanuel is what the Messiah is supposed “to be called” or what He is. It’s like a nickname, one that describes His nature. Yes, He is the Son of God and He is certainly the Anointed One, but none of these is His actual name. 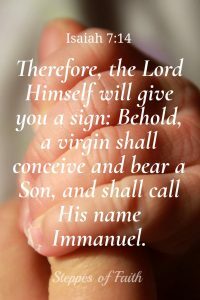 His real name is Jesus, and everything else, including Immanuel, describes His nature or character. Jesus took on human flesh and came to dwell among us (John 1:1,14), but He was always Immanuel. God was and is always with us. By stepping out of heaven and into a sinful world, Jesus proved God’s character, that He is with us everywhere we are, and He walks with us through every circumstance to bring us His righteousness (2 Corinthians 5:21). He loves us with such an everlasting love that He would, in every sense, move heaven and earth to save us from eternal death and punishment. Jesus is His name, but His character, His essence, is Immanuel. He is forever with us. Have you ever been confused by the different names for Jesus? Did you know that there are actually over 60 names for the Lord in the Bible? Which one(s) are your favorite? Let us know right here. Let’s help each other explore new ways to worship Jesus. And don’t miss Three Gifts of the Father’s Love. What are the three gifts God gave us when Jesus was born? You can read all about it here. Some information for this article was also gathered from Apologetics Press.